The title appears controversial, sure. It's not exactly my viewpoint, and I'm sure it's not the viewpoint of the majority of the Royals faithful as well. I will readily admit that I, in fact, may have even violated Journalism Rule #101: No Purposefully Misleading Titles However, the title is certainly an argument that could - and has - been generated among the most cynical of the Royals fanbase. Approximately one and a half years into his tenure with the Royals, Dayton Moore has failed to capitalize off an incredibly poor offense that reared its ugly head almost nightly under the latter part of Allard Baird's tenure (R.I.P.) One must assume that inheriting a historically awful baseball team is an easy task, as many believe it is not difficult to transform a terrible ballclub into merely a mediocre one, or to a lesser extent a mediocre one into an average one, and so forth. In turn, a new General Manager, particularly one from a successful organization such as Atlanta, often can conveniently assume a "hero" status among the fanbase who have endured consistent losing under an in-grossly-over-his-head G.M. By focusing on this article, we must first examine another important aspect of the game in which Moore has demonstrated a keen knowledge - and ability to understand and develop in "X" ballclub - PITCHING! 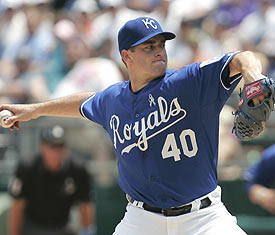 Brian Bannister was one of several of Moore's low-budget, low-risk acquisitions to experience success - and truly dominate - at times in 2007. In what many baseball experts, analysts, and, yes, Royals fans deemed as a triumphant victory on the trade front, Moore was able to coax Rockies' G.M. Dan O'Dowd into acquiring a promising but declining (and whiny) young lefthander in Jeremy Affeldt (pictured below) and a more-unsturdy-and-breakable-than-day-old-yogurt-turned-crust Denny Bautista for a young, inexpensive, power-hitting first baseman in Ryan Shealy and a throw-in mediocre reliever named Scott Dohmann. Ryan Shealy had absolutely mashed in each of his stops within the Rockies' farm system. Although he was too grizzled to be deemed a true prospect (he was 27), Shealy had found himself deadlocked on the MLB roster without a starting job, as perennial All-Star Todd Helton raked with the big club, and appeared destined for at least one more year as full-time first baseman in Colorado after their front office tried feverishly to trade him, but ultimately to no avail. Shealy's Minor League + Major League Numbers. As a setup man, Jeremy Affeldt has proceeded to accomplish more out-notching and less tearjerking in Colorado than he ever did in Kansas City. Even beyond nabbing a high-upside first baseman, Moore's work was still cut out for him in order to transform our offense from mediocre levels in `06 to perhaps average or above average levels in `07. Or was it? At age 27, David DeJesus was entering his first prime season, and a season in which most youngsters are expected to break through offensively. Emil Brown had enjoyed two years of above-average offensive and average defensive seasons in '05 and '06. Mark Teahen raked baseballs like it was his job in the second half of 2006 (okay, it theoretically was his job), and like DeJesus, was just entering the prime of his career (age 26). Was it the rust from his offseason arm surgery? Unfortunately, that's a question we don't have the answer to. Many scouts projected John Buck to be a 20-25 HR, .450+ slugging everyday catcher in the big leagues. Hey, good enough for me! Except that Buck was primed for such a breakout season in 2007. Although Buck showed exceptional promise in April, that promise turned sour by mid-May and never fully resurfaced. Still, his 2007 , numberwise, was only an ever-so-slight improvement on his previous two seasons. Although he had never proven to be an everyday player, Ross Gload had showed promise in limited duty with the White Sox. 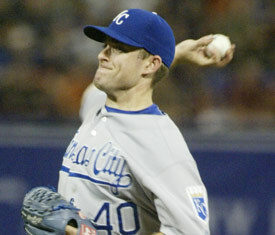 Perhaps he could carry his with Kansas City as a platoon and part-time first baseman and corner outfielder. As Royals fans, we discovered fairly quickly that real-life baseball doesn't exactly reflect MVP Baseball 2005, where productive part-timers can magically become legitimate RBI-men overnight. Over on the other hot corner, Gordon began 2007 in such a tremendous slump, that his offensive "damage" (a relative term) done in April and May would have been almost impossible for him to compensate for in the final four months. Although Gordon regained his swing, he finished the season with lukewarm results. But perhaps an uber-productive rookie season is too much to ask for? FACT: With DeJesus, Buck, Pena, and Teahen entering their prime, the Royals responded by finishing dead last in the American League in slugging percentage and home runs, and second to last in on-base percentage, walks, and runs scored. With a completely unprotected and fast-declining Mike Sweeney as our cleanup hitter from July 2004 through the final days of Baird's tenure, Moore had every opportunity to acquire meaningful protection in the lineup, either through the form of a veteran free agent or a low-risk/high-upside player. Sadly, neither happened, and the Royals were stuck with virtually the same team that ended 2006, with the additions of a below average first baseman (Ross Gload), and one and a half emerging young prospects (Gordon and Billy Butler for approximately 100 games). Instead of improving our power numbers and plate discipline, we faltered. Which brings us to another fascinating topic: plate discipline. Virtually every stathead, from Bill James to Baseball Prospectus to Rob Neyer, have proven over the years with overwhelming evidence, that plate discipline helps offense overall for any team - from the slugging Bronx Bombers to our own Boys in Blue. I mean, remember that excruciatingly long list of obscure pitchers who had shut down the Royals this season, allowing an insubordinately few amount of walks and lasting, like, seven-plus innings? Yeah, that one. Forget it. The list is simply too long. Given that our offense included once-heralded Moneyball player Mark Teahen, plate discipline extraordinaire David DeJesus, the always patient Esteban German and the mostly patient John Buck all entering their prime, there was no reason for us innocent fans to witness such a dropoff - and dramatic embarrassment overall - in overall plate discipline. Given our lack of power, there was no reason the Royals should have demonstrated such a "hack-tastic" offensive approach in 2007. Nonetheless, these quotes from fearless leader Buddy Bell (now enthusiastically helping the White Sox in situational bunting and hit-and-run strategies), seemed to indicate a "Be Aggressive or Die!" approach. "For us to be the kind of team we want to be, we've got to figure out how to approach pitchers like we've seen the first eight or nine games," Bell said. "I think that is a more aggressive approach early in the count." "We have to be more aggressive early in the count. I keep saying that, all the time, and I hope eventually it will start to sink in. We take too many early fastballs. We're a young team, and the only way we're going to find out about our swings is to be aggressive." "I think we tend to be too particular with our strike zone. And we just have to be more aggressive. "We refuse to be aggressive offensively," Bell said. "It's driving me crazy. "We were not aggressive," Bell said. "We talked about that before. We let strikes go and we swing at balls." "This is the big leagues and you've got to be aggressive up there." (Note: If anyone would like a link to each of these articles, do not hesitate to contact me personally at JRaider2005@yahoo.com. Or simply do a Google search of "Buddy Bell" and "aggressive" and you'll find a gaquadzagillion results). Either way, The Royals offense was as meagerly power and OBP-thirsty as it was utterly pathetic in 2007 (which is redundant, no?). Perhaps some of the Royals' inabilities with the lumber fall square on the shoulders of Buddy Bell and our hitting coach Mike Barnett. However, those philosophies have to fall back again - square (or as South Park's Cartman says, squaaaaihhh) upon the shoulders of Dayton Moore. Nonetheless, it will be an exciting offseason for Moore and our Boys in Blue. Moore will, once again, have plenty of work to do to improve our offensive output. Will he seek players via the Free Agent route (Jones? Rowand? ), the young and cheap route (Francisco? Quentin?) or the perhaps the Japanese route (Fukudome?). All that's crystal clear is that Moore needs to try something. And hopefully this time around, that something will work.